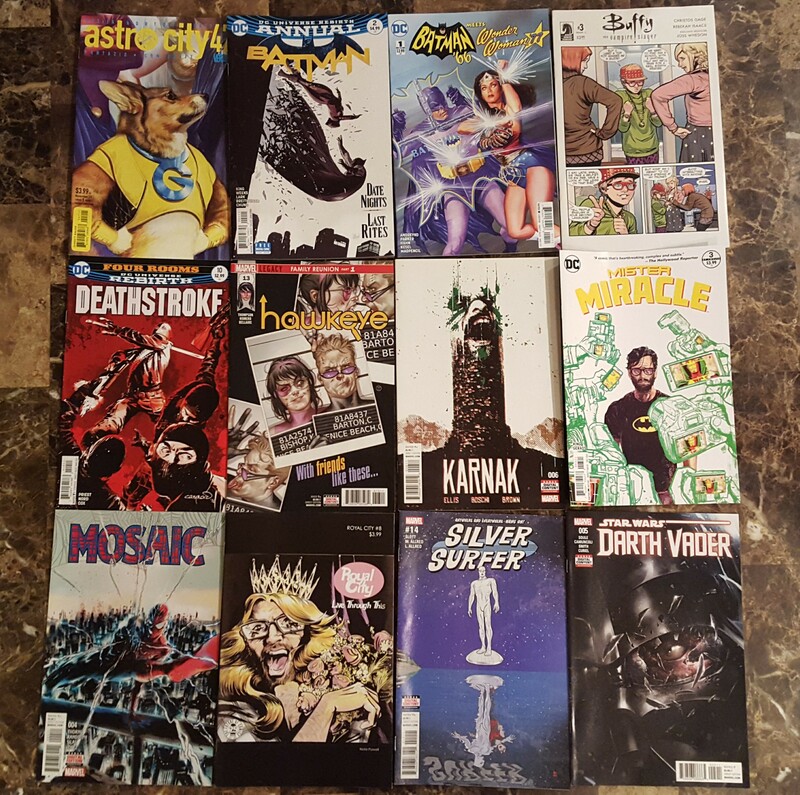 Comics Update: My Current Lineup and 2017 Pros & Cons « Midlife Crisis Crossover! 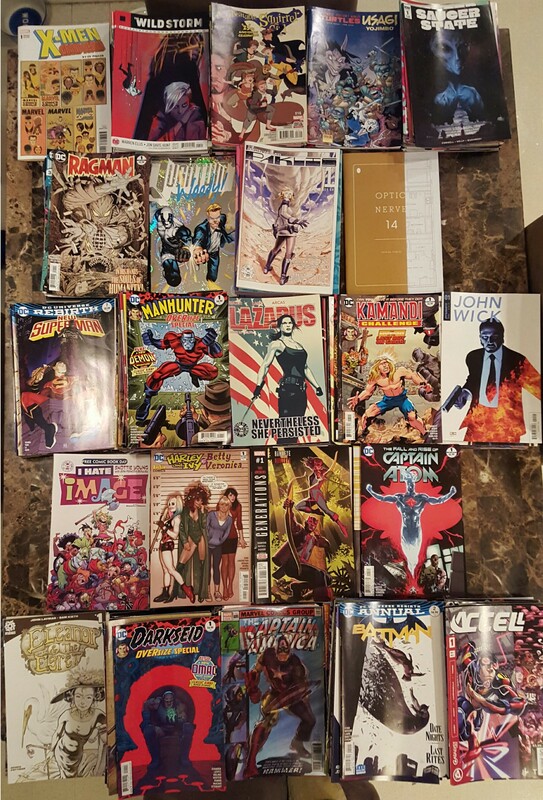 All my 2017 singles divided and alphabetized from A to X but skipping V.
Comics collecting has been my primary geek interest since age 6, but I have a tough time writing about it with any regularity. 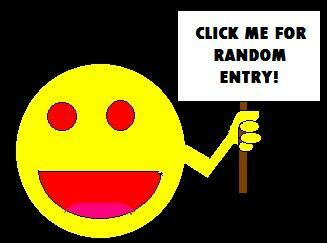 My criteria can seem weird and unfair to other fans who don’t share them. I like discussing them if asked, which is rare, but I loathe debating them. It doesn’t help that I skip most crossovers and tend to gravitate toward titles with smaller audiences, which means whenever companies need to save a buck, my favorites are usually first on the chopping block. I doubt many comics readers follow MCC anyway, so it’s the perfect place to talk about comics all to myself. Whee. 2017 certainly hasn’t been a boring year for discussions. In addition to undergoing a light-handed version of the anti-sexual harassment revolution that’s sweeping Hollywood, the comics field has seen DC’s Rebirth initiative still going strong on the learning curve from the “New 52” misfire. Meanwhile, the “Marvel Legacy” campaign — their fifth line-wide restart in eight years or so — was founded on the assumption that old folks like me and the Kids These Days are dying to watch comics regress to the ’70s and ’80s. So far they’ve been wrong and sales have nosedived on a number of titles. The cancellations that made room for this ploy have been followed in short order by still more cancellations of their usurpers. I’m still finding Marvel-labeled reading to my tastes, but I’m glad they’re not the only choices at my local comic shop. Captain America – Mark Waid and Chris Samnee, who previously teamed up on a decent Black Widow series and a fantastic extended run on Daredevil, reunite for new adventures of Steve Rogers, the original Star-Spangled Avenger. Back in the suit after the events of Secret Empire that we as a hobby community should never speak of again, Our Hero is currently on a road trip through the heart of America to defend the weak and meet new challenges. I can relate. Hawkeye – Canceled but not over yet. Kelly Thompson and Leonardo Romero are no Fraction/Aja, but the further adventures of Kate Bishop have had their entertaining moments, augmented by Kate’s Sherlock-esque surroundings-evaluation technique, her stubborn spirit, and an endless supply of frozen peas to soothe her ever-growing collection of wounds. I wish her new set of friends were more memorable (I can’t remember any of their names at the moment), but eventually I stopped missing Clint Barton and enjoyed Kate’s L.A. adventures on her own terms. I assume this won’t be the last we see of her? Hopefully? Marvel 2 in One – Marvel still refuses to publish Fantastic Four comics while Fox insists on degrading them on the big screen, but they’ve agreed to compromise with a relaunch of the Thing’s old team-up title from my youth. The first arc is essentially a “Fantastic Two” buddy-hero duet, with Ben Grimm trying to help his annoying old pal the Human Torch take his mind off his missing family and his weakening powers, while also trying to ignore condescending assistance from former villain Victor von Doom, who’s now reformed and become an Iron Man in some other comics I didn’t read. Chip Zdarsky nails the contentious camaraderie between the FF’s brasher half with humor and pathos, while artist Jim Cheung delivers the best-looking Marvel book on my reading pile at the moment. Moon Knight – The bizarre, hallucinatory Jeff Lemire/Greg Smallwood run ended in suitably puzzling fashion, canceled to make way for the Marvel Legacy reboot by Max Bemis (frontman for the band Say Anything) and Jacen Burrows (who cut his teeth on grimdark works at Avatar Press), whose take on the multi-personality avenger is one of the most brightly colored horror comics around, which is not exactly a compliment. For now it’s still on probation with me. Ms. Marvel – The aftershocks of the vastly underwhelming Civil War II crossover, which I avoided everywhere but here, continue reverberating throughout Ms. Khan’s neighborhood, ruining her relationships with her best friend Bruno and her idol Captain Marvel (a CWII victim of character assassination), and forcing her to confront a takeover of Jersey City government by ripped-from-Twitter-Moments idiot forces of relevance whose momentary success in their scheme’s early stages never made sense to me…much like our actual politics of the past two years. So I withdrew my objection and hope see at least some of Kamala’s relationships restored in the months ahead, because seeing her separated from her strong supporting cast is a bummer. Runaways – The best new series of 2017. I don’t have Hulu and can’t comment on the TV adaptation of the classic A++++ Vaughan/Alphona originals, but YA author Rainbow Rowell and artist Kris Anka have bypassed the popular tabula rasa reboot approach and taken on the mighty task of confronting the damage done to Our Heroes by other writers since their last cancellation years ago. Nico, Chase, Karolina, Molly, Victor, and even Gertie and her raptor Old Lace are all back, but most of them aren’t the same kids they were in their heyday. They’re already dealing with another evil family issue even as they’re figuring out that sometimes getting the ol’ gang back together isn’t as easy as pretending the last several years never happened. My wife Anne only reads a handful of monthly comics, 95% of which are Marvel’s Star Wars output. Star Wars – The flagship among the four ongoing series is also my least favorite. Someone in a marketing position has decreed its primary goal is unceasing worship of the Luke/Han/Leia holy trinity, of which I am not an unconditional acolyte. The “Screaming Citadel” crossover quickened the pulse a tad, but the past few months have brought unmemorable tales as well as the pain of someone (an editor? a Lucasfilm official? the artist himself?) thinking it was an awesome idea to replace some of Salvador Larroca’s line-drawn character faces with actual photo-heads extracted straight from original Star Wars film cells. Mixing fumetti with hand-drawn art can work for selective comedic purposes, I’ll grant, but this slavish insistence on capturing actors’ likenesses by the most awkward possible means is off-putting and not the least bit endearing. Star Wars: Darth Vader – For some reason the end of Kieron Gillen’s run meant Charles Soule’s takeover needed its own #1. Comics math is dumb sometimes, and Soule and Giuseppe Camuncoli may have a different tone, but Vader is Vader is Vader. Regardless, the first two arcs have shared a formula of “Vader meets new person and then gets rid of them”, which I hope won’t define all future arcs. The first arc promised an intriguingly designed opponent only to cut hopes severely short, but the second bout — a showdown with Jedi librarian Jocasta Nu from the Prequels trilogy — was full of surprises and inspired moments. More arcs like that, pretty please. Star Wars: Doctor Aphra – The Harley Quinn of Marvel’s Star Wars line was promoted to her own series along with her erstwhile subordinates, the sadistic evil droids Beetee and Triple-Zero. When the three of them engage in cutting repartee — sometimes literally, in the droids’ case — it’s Suicide Squad antihero magic. When the droids are off screen I’m less enthusiastic, though this year’s big con-game arc “Doctor Aphra and the Enormous Profit” was a breath of fresh air, forcing the morally deficient space archaeologist into a precarious situation for a potential Ocean’s-style payoff. 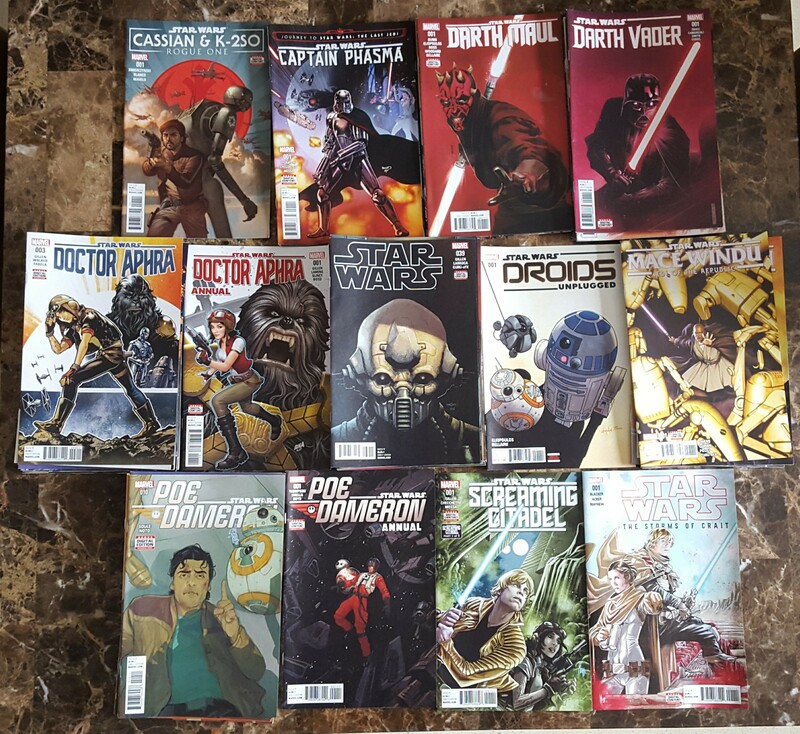 Star Wars: Poe Dameron – In my favorite of the four SW books, Charles Soule continues to channel Oscar Isaacs’ performance into print with delightful accuracy, and keeps me invested in the continuing subplot saga of Terex, former First Order spy demoted to lackey yet dead set on securing his role as Poe’s arch-nemesis. I don’t mind Phil Noto’s painted covers on occasion, but his interior pages tend to be stiff and I’ve much preferred the work of replacement artist Angel Unzueta, a better fit for dynamic action-adventure. Squirrel Girl’s “Previously on” recaps come in handy fake-tweet format. Now that Silver Surfer has ended, hers is the other comics series that Anne follows. Unbeatable Squirrel Girl – Still among the best Marvel things of the millennium. Ryan North and Erica Henderson show no signs of slowing down yet and largely avoided the “Marvel Legacy” backlash. Accomplishments this year include luring Garfield creator Jim Davis into his first sequential comic-book work, albeit for two pages of Galactus dad-jokes; and giving birth to the wonder that was Dinosaur Ultron, in a manner that is now official Marvel continuity canon and makes totally perfect sense from a Marvel universe science perspective. Well, I mean, it does to to any readers who don’t have too much starch in their T-shirt collar. If there are any social circles out there bellowing at each other, “DINOSAUR ULTRON IS WHAT’S WRONG WITH COMICS!” I would contend they should buy a mirror, think harder, but keep buying Unbeatable Squirrel Girl anyway so this book can live forever. Astro City — Kurt Busiek, Brent Anderson, cover artist Alex Ross, and a fine roster of pinch-hitting artists keep the hits coming, 22 years and counting, almost single-handedly bearing the banner of the once-mighty, moribund Vertigo line all to themselves. The jazz-era short stories that led off the year seemed to fall short for me, but one of my favorite stories of 2017 across all media was the “Good Dog” two-parter from #47-48 (perfectly drawn by guest Mike Norton), about a young burglar, a discovered doggo, a magic amulet, an unlikely hero, and an unforgettable friendship. Honestly, I’m tearing up a little just remembering it. 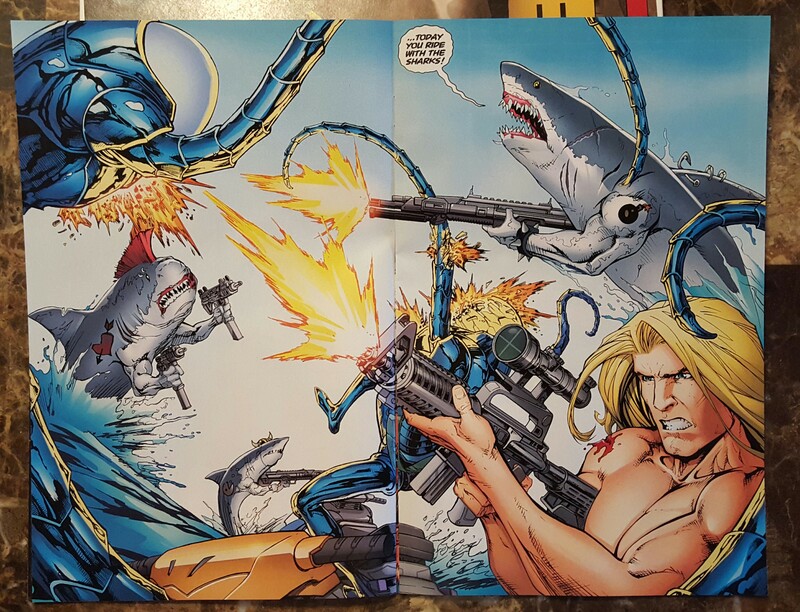 Deathstroke – When Christopher Priest writes comics, I’m there. Priest gave us the definitive Black Panther, the once-great Quantum and Woody, the last days of the original Power Man and Iron Fist, and more more more. DC lured him back to the field with what remains my favorite among the “Rebirth” titles, though his typically complex story construction and fondness for waiting till the end of a given arc to do recaps and explanations required a bit more intensive attention when the book downshifted from a fortnightly to monthly schedule. I was a bit peeved that our antihero Slade Wilson experienced a crucial epiphany in a crossover I refused to buy, which altered the book’s direction ever after, but it’s nonetheless been interesting to chart the side effects of the mercenary with a massive body count supposedly turn the other cheek, walk away from murdering, and form his own super-hero team full of youngsters who hope and pray he’s not playing five-dimensional chess with their heads. If he isn’t, we can bet Priest is. Doom Patrol – Grant Morrison’s number one follower Gerard Way (he of My Chemical Romance fame) already penned his ultimate love letter years ago with his creator-owned comic Umbrella Academy (soon to be a Netflix TV series!). Now he’s nabbed the ideal gig of writing the oddball super-team on which Morrison himself once performed an eclectic overhaul. The flagship title of DC’s Young Animal line, of which Mr. Way is also the guiding light, is basically Morrison redux — many of the same characters returned, some in altered states, plus a handful of new characters for value-added verve and/or confusion. Ideas fly off the page at a furious rate if not always in straightforward, accessible fashion, possibly an ideal design for today’s reader who prizes imagery over narrative flow. Harley & Ivy Meet Betty & Veronica – In this, the Year of the Woman, Archie and DC join forces and really hope there’s a market for that and incidentally for this six-issue miniseries. Harley’s co-creator Paul Dini is among the talents on board, which means good things and happy laughs have been the order of the day in both Riverdale and Gotham for what’s now been revealed as…a body-swap comedy! I can confirm hilarity has indeed ensued. I’m grateful because I have zero interest in Serious Archie. Like, absolute zero. Justice League – The last time I followed DC’s legendary super-team regularly was [checks notes] possibly Dwayne McDuffie’s truncated run from about a decade ago. But now Christopher Priest has been invited to write an arc, so I’m on board for a few issues. “The People vs. Justice League” wasted no time in making trouble for Our Heroes as either someone is framing them for civilian deaths or they’re all in need of time-outs. Batman has seen his fatigue possibly result in civilian death, while Wonder Woman may or may not have stabbed an innocent in her way. Can they get their act together before more deaths occur, and before DC revokes Priest’s invitation as they did with McDuffie all those years ago? Mister Miracle – Tom King, the best new writer in comics in a long time, brings more of the magic he’s cast upon unique efforts like The Vision, Omega Men, and The Sheriff of Babylon. Jack Kirby’s classic escape-artist hero and his wife Big Barda are back in this unsettling 12-issue maxiseries, but while Darkseid lurks in the shadows, their greatest enemy appears to be Orion, current Highfather of the New Gods, who seems to have become a power-mad jerk who’s ten times worse than the drill sergeant from Full Metal Jacket and who’s ordered Scott Free executed for the crime of Not Properly Toadying. For now not all answers have been forthcoming, as King is playing a long game and revealing his cards slowly, which is fine and I can deal even though I want to read it all now now now. Sheriff of Babylon collaborator Mitch Gerads has become one of my favorite monthly artists and is more than doing his part to produce one of the most wondrous works of art here. Mystik U – Former DC/Vertigo editor Alisa Kwitney returns to the company as writer of this reboot, envisioning DC’s magic-based characters as older teens learning to magic-use together as classmates in a Harry Potter-ish college setting. Zatanna leads the way with a few familiar faces and a couple of new ones, in a take that could be fun but is only one issue in. On probation for now. New Super-Man – The book’s best joke is that its unabashed derivation from the Man of Steel isn’t just typical spin-off procedure; it’s literally the whole point and the starting point for one young man’s quest for uniqueness. Gene Luen Yang’s engrossing take on a young, artificially empowered Chinese Superman proves DC’s “Rebirth” has made room for a bit of old-fashioned heroic fun in today’s stodgy DCU. The series will soon be retitled New Super-Man and the Justice League of China, which is ridiculously overlong but pretty much what’s been happening anyway, with our hero-in-training Kenan Kong teaming up with an assortment of JLA analogs who’ve helped him deal with China’s old-guard heroes and uncover secrets both about his unusual parents and the uniquely non-Kryptonian facets of his power set. Ragman – If you’ve only seen him on TV’s Arrow, you haven’t seen Ragman. Then again, if you’re buying this miniseries reboot, you still haven’t seen Ragman. His intrinsic Jewish roots have been all but burned away, and he has no creepy cape, the best part of his original design — just lots of unraveling, animated Mummy gauze. I’m sticking around for the fine art of Inaki Miranda, but not finding a lot of Joe Kubert’s DNA remaining and already bored with the faceless supernatural baddies muddying up things. The Wild Storm – Warren Ellis’s reboot of Jim Lee’s Wildstorm Universe has begun here. Some of the original WildCATs are back in varying degrees, as are select veterans from Stormwatch and the Authority, pawns in a conflict between warring American spy agencies with aliens biding their time in the background. The razor-sharp bickering between characters is an Ellis trademark that’s always a draw for me, and the action scenes choreographed by Jon Davis-Hunt have a pleasing John Woo slo-mo aura about them. On the downside, the covers in general (by more than one artist) have been so astoundingly unmemorable that there were two issues I bought twice (two of them, mind you) because I didn’t recognize them from my reading pile the week before. Wildstorm: Michael Cray – The first of a few planned Wild Storm spin-offs stars the mercenary formerly known as Deathblow. He’s still a killer on the government’s behalf, but his mission on this new, separate Earth is wholly unexpected: each two-parter has pitted him against this Earth’s twisted counterparts to the JLA. #1-2 saw a bitter Oliver Queen who oversees “The Most Dangerous Game” on his very own island; #3-4 gave us Dark Barry Allen, a paranoid-schizophrenic scientist who’s murdering with technologically simulated super-speed. Ellis is more or less an executive producer working with writer Bryan Hill (Postal) for this not-bad side quest, but the art seems to be losing details with each passing issue. Copperhead – Back on schedule with new artist Drew Moss and still full of surprises in this sci-fi Western about a space sheriff and her son trying to start a new life in a faraway Godforsaken town despite the corrupt mayor, the former alien partner who’s now her angry boss, the indigenous alien robot hiding out in the shadows, the occasional murder mysteries, and the vengeful ex-husband who’s hot on their trail. The artist-hunt hiatus nearly made me forget this was around, but I’m hanging on the best I can even though my shop is only ordering one copy per issue, and another shopper has beaten me to it at least twice now. Descender – Jeff Lemire and Dustin Nguyen’s watercolored sci-fi epic continues with a lot of the game-board setup from Year 1 coming to bear in the “Rise of the Robots” arc, where unpleasant results have befallen more than one cast member. Pretty to look at, alarming to read at times. The Dying and the Dead – #1 was published in January 2015. #4 through #6 were finally published in 2017, when it was also decided this Jonathan Hickman joint would max out at ten issues, which might see print before my 50th birthday and hopefully form at least one complete story. Considering all three of these latest issues were flashbacks, this cross between The Dirty Dozen and Red with a dash of Prometheus overlord aliens is pointless to recommend midstream. Injection – Warren Ellis is at his best when state-of-the-art unbelievable real-world science is involved. Add in a dose of otherworldly magic opponents and an angry A.I. as the Big Bad, and you’ve got this fantasy/SF ensemble, which saw two arcs in 2017 — one about Stonehenge as a doorway to horrors and the other as a showcase for teammate Vivek Headland who will find new ways to harm you for describing him as an Indian Sherlock, which is unfairly reductive on so many levels that I should just stop typing now except to note ongoing fascination both with him and with the amazing colossal art team of Declan Shalvey and Jordie Bellaire. Lazarus – Currently on hiatus so artist Michael Lark can catch his breath. In the meantime, the bridging miniseries Lazarus X+66 has taken us into the minds of the supporting cast at various points of this post-apocalyptic world where Earth’s remaining livable continents have been divvied up between the few richest families who essentially keep societies running on a de facto feudal system. The regular series paused on a heck of a season finale, but the interstitial vignettes are worth the time for regular readers. Manifest Destiny – Lewis and Clark and Monsters soldiers onward through the American frontier against the onslaught of hallucinations that nearly had our party killing each other off before they thankfully thought through the mess and lived to see the birth of Sacajawea’s baby. And then the early American grotesquerie continued, and something’s still not right with Sacajawea herself, but we’ll see what 2018 brings. Probably more madness, I imagine. Paper Girls – Brian K. Vaughan and Cliff Chiang gave us a few solid clues as to what’s really going on behind the scenes with our time-displaced news-carrying young ladies, the broken-English future-dwelling soldiers who menace them on and off, the future versions of themselves who have surprise issues, and the giant mech battles not everyone can see. I was worried Vaughan might be turning this into his very own Lost with millions of questions and zero answers, but we saw slight hope that my fears were unfounded. Maybe. Royal City – The prolific, previously mentioned Jeff Lemire finds even more spare minutes in the day to write and draw this labor of love about a broken family in a disintegrating blue-collar town who each see different ghostly versions of the one brother whose mysterious death tore them all apart. Spooky yet grounded in the reality of today’s not-so-idyllic countryside life. Rumble – Restarted from #1 with a new artist, John Arcudi’s wacked-out sword-and-sorcery shenanigans continue destabilizing an average city neighborhood and the lives of the two barflies who fought the good fight against them along with their weird friend, an other-dimensional swordsman trapped in a scarecrow’s body but armed with a giant sword that would make Conan jealous. Snotgirl – I never imagined myself buying comics about skin-deep fashion bloggers, but it’s co-created by Bryan Lee O’Malley, the genius behind Scott Pilgrim. I’m not sure I’m the book’s target audience, but I keep tagging along anyway just in case. Atomic Robo and the Spectre of Tomorrow – More fun science adventures with Atomic Robo, whom I’ve finally forgiven for that immensely frustrating animated Kickstarter project. Anyone who likes the fun of Unbeatable Squirrel Girl would do well to give this a shot, though I’m at a loss as to what order to read the timeline-hopping trade collections in. Monstro Mechanica – New series from local up-‘n’-coming writer Paul Allor about an alt-history Renaissance in which Leonardo da Vinci has invented the world’s first working robot prototype, though that word doesn’t exist yet, and entrusted its daily oversight to his female assistant, with adventurous results and Medicis abounding. …um, funny thing: until I began compiling this overlong entry, I didn’t realize that a lot of indie series I followed into 2017 either ended, got canceled, or lost my interest. This section wound up embarrassingly shorter than I imagined. Rats. Archangel – In which celebrated sci-fi author William Gibson admits the ending was changed at the last minute for political relevance, and it shows — not only in me slapping my forehead at the ending that feels clichéd to anyone who’s on Twitter too much, but in the slapdash artwork that was obviously rushed to finish the project. Atomic Robo and the Temple of Od – More same Atomic Robo. Yay! Black Widow – Reminded me of high-adventure comic strips that previous generations dug, but canceled to make way for “Marvel Legacy”. Crosswind – More body-swapping like the aforementioned DC/Archie crossover, except this one’s R-rated crime drama in a Tarantino vein, in a good way. Great Lakes Avengers – Fun times, but canceled to make way for “Marvel Legacy”. Jughead – Canceled to make way for Serious Archie, I guess. Karnak – One of Marvel’s most nihilistic products of all time, but canceled after months-long delays between issues due to artist problems. Mosaic – A promising new hero from one of the writers behind Leverage (which my wife and I finally finished watching this month), but canceled to make way for “Marvel Legacy”. Power Man & Iron Fist – Brought back Alex Wilder from Runaways right before being canceled to split them into separate solo books with rigid skin-color boundaries, which seemed all kinds of incorrect. Shade the Changing Girl – My favorite of the four Young Animals launch titles ended with #12 and nobody told me till I just now looked it up. Silver Surfer – Ended as planned, bowing out with one of comics’ most emotional moments this year as our hero bade farewell to his companion Dawn Greenwood in the most Doctor Who-iffic way possible. The commendable saga from Dan Slott and the Allreds will be quite missed in this household. Unstoppable Wasp – A lot like Unbeatable Squirrel Girl with a different yet no less viable sense of humor, but firmly entrenched in recent, obscure-to-me Marvel continuity. Canceled to make way for “Marvel Legacy”. Batman ’66 Meets Wonder Woman ’77 – A massively awesome escapade for anyone over 30 who watched as much super-hero TV as Anne and I did. Among other details, at long last we know what Batman ’77 might have looked like in this vein. Buffy the Vampire Slayer Season 11 – A short 12-issue season ended its magic-concentration-camp storyline with a political Moral of the Story and a bonus kaiju. Not my favorite comics season, but not bad. Bug! The Adventures of Forager – Those wild ‘n’ wacky Allreds, at it again. 4 Kids Walk Into a Bank – This talky yet worthy crime drama needs a reread, because the months-long wait between issues (for which co-creator Matthew Rosenberg profusely apologized months ago) murdered its momentum. Groo: Fray of the Gods – Fans of Sergio Aragones’ and Mark Evanier’s four or five jokes will still find them here in abundance. Longtime fans will recognize that’s a compliment. Inhumans: Once & Future Kings – In which Christopher Priest proves he’s the G.O.A.T. by bringing eminent readability to the stars of the worst superhero show since The Cape. Journey to Star Wars: The Last Jedi – Captain Phasma – Fabulous armor notwithstanding, I still really don’t care about Ms. Boba Fett. Kamandi Challenge – A bevy of DC creators pays tribute to Jack Kirby’s post-apocalyptic Kid Tarzan with a 12-issue round-robin challenge. None of the teams failed to entertain, but the best match-up by far was Tom King, Freddie Williams III, and, in his DC Comics debut, Teenage Mutant Ninja Turtles co-creator Kevin Eastman. Man-Thing – RL Stine, creator of Goosebumps, made his comics debut with a Marvel miniseries jam-packed with the cheesiest, most painful one-liners since ABC’s TGIF line-up went off the air. And yet I bought the whole thing because I couldn’t look away. Star Wars: Darth Maul – Mostly harmless. Star Wars: Mace Windu – An okay attempt to capture Samuel L. Jackson not acting like himsself, but Denys Cowan, one of my favorite pencillers since childhood, needed a stronger inker. Wonder Woman ’77 Meets the Bionic Woman – Another retro-TV throwback to times of yore, but somehow we missed #6 and didn’t realize it till I sorted twelve months of comics and finally noticed. Oops. Accel / Noble / Superb – The Lion Forge Comics superhero universe started off strong with a Free Comic Book Day one-shot written by Christopher Priest, who as previously established makes any and all things better. The lineup that branched out of that was…well, just-okay superhero stuff. Angel Season 11 – No trace of the Joss Whedon voice, or much in the way of leavening humor. Without a strong cast to bounce off, Angel alone can be kind of a dullard. Archie – Everyone else loves Riverdale, so it made sense from a marketing perspective to switch gears for a deadly serious storyline. To me the gags and repartee were my entire reason for digging Mark Waid’s Archie. Batman/The Shadow – Set in an era when Batman was a dumb rookie who hadn’t yet encountered magic or fantasy or superpowers — i.e., the most boring Batman imaginable. Betty & Veronica – After walking away from Archie and waving bye-bye to Jughead, my initial enthusiasm for Adam Hughes’ lighthearted spinoff dissipated. Black Lightning: Cold Dead Hands – Creator Tony Isabella is tickled pink to see DC’s first prominent black superhero brought to new life on TV and returned to print, but this miniseries seems to be straining for a sociopolitical relevance that the first two episodes from The CW managed without breaking a sweat. Black Panther – 90% of what Ta-Nehisi Coates brought to the table was characters monologuing at each other. The rest was a small crop of obligatory fight scenes given short shrift in my least favorite style — pin-up montages instead of real-time, blow-by-blow narrative. I hung on for all of Year 1 but couldn’t go on. If the movie is three hours of crosstalk soliloquies, I’m in deep trouble. Cave Carson Has a Cybernetic Eye – My local shop stopped ordering it and I didn’t feel attached enough to pursue it. The Comic Book History of Comics – Either my shop stopped ordering the color reprints or I wasn’t paying attention. I’ll have to chase after the trade. Eleanor & the Egret – Oddball item from John Layman, co-creator of Chew, and Sam Kieth, co-creator of The Maxx. I forgot its contents within 24 hours. Eternal Empire – I had high hopes for this new project from the creators of the top-notch Alex + Ada, but I was left cold halfway through the first issue. For some reason non-Tolkien fantasy works haven’t succeeded well with me since high school. The Fall and Rise of Captain Atom – Attempted reboot that gave me no reason to forget the classic Cary Bates/Pat Broderick version, despite Bates’ involvement. Future Quest – One of the more inspired, less head-scratching titles among DC’s Hanna-Barbera reboots, but felt inessential as a monthly read. Luke Cage – David Walker is a fine writer, but couldn’t rise above the journeyman artists Marvel kept assigning to their big Netflix hero. One of the first wave of casualties within “Marvel Legacy” itself. …and that’s me and comics in 2017, mostly. If this 5000-word blog-bomb wasn’t enough for someone out there, we previously covered my 2017 in graphic novels as a two-parter right here and then over here. See you next year, and please enjoy this parting gift of some of the best covers that got me to keep buying comics in 2017. Cheers! Finding strong, memorable covers was kind of tough. I don’t care for pinups that have nothing to do with the interior contents, and too many covers are just Hero A punching Villain B — or worse, punching Hero C — offering nothing to lure in new readers. Y’know, like in the old days when comics used to fly off newsstands. « Our 2008 Road Trip, Part 6: By Neptune’s Trident!